Don’t Trust the UN with Your Recycling (rates). Every week I receive at least one query asking me for pointers on finding statistics regarding how much China recycles on an annual basis. And, for the most part, my answer is the same: check Google, or check the trade publications. 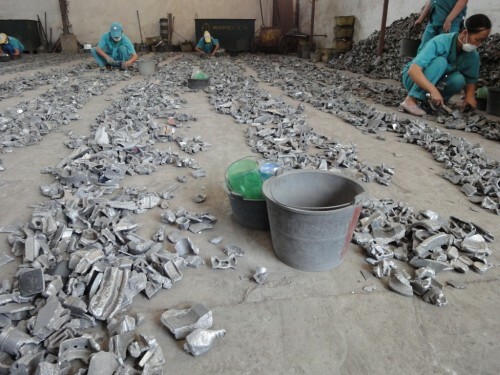 For example, a simple google search will reveal that China generated and recycled around 90 million metric tons of iron and steel scrap in 2010 – a volume greater than the steel produced in all but two countries (China and Japan). And if you’re lucky enough to have a subscription to Scrap Magazine, or Recycling International, you would’ve learned, in the Jan/Feb issues of both magazines, respectively, that China generated and recycled 2.32 million metric tons of its own – not imported! – aluminum in 2009 – a volume greater than the total steel manufactured in all but two countries (China and Russia). Below, an image taken at a large-scale, highly efficient aluminum scrap processing operation in South China (by me).